Bristol Instruments 671 Series Laser Wavelength Meter | EINST Technology Pte Ltd.
Bristol Instruments’ wavelength meters are for scientists and engineers who need to know the exact wavelength of their lasers. These systems use proven interferometer-based technology to measure absolute wavelength to an accuracy as high as ± 0.0001 nm. 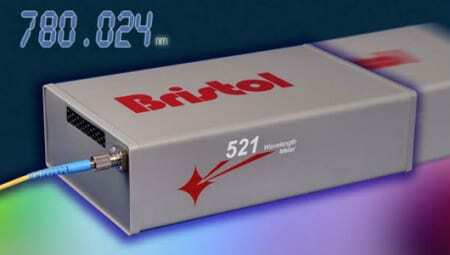 To achieve the reliable accuracy that is expected from Bristol Instruments, all of its wavelength meters include a built-in wavelength standard for continuous calibration. Systems are available for CW and pulsed lasers that operate at wavelengths from 350 nm to 12 µm. The best way to determine the absolute wavelength of CW lasers is with the 671 Series Laser Wavelength Meter. 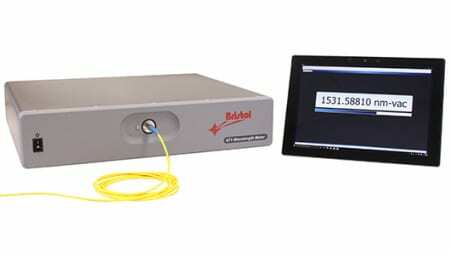 This system provides real-time laser wavelength information measured to an accuracy as high as ± 0.2 parts per million. This accuracy is guaranteed by continuous calibration with a built-in wavelength standard which ensures the reliable accuracy that is needed to generate the most meaningful experimental results. The 671 Laser Wavelength Meter uses a proven Michelson interferometer-based design to accurately measure the absolute wavelength of CW and quasi-CW lasers. Two versions are available. 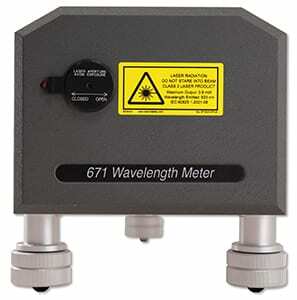 The model 671A is the most precise, measuring wavelength to an accuracy of ± 0.2 parts per million (± 0.0002 nm at 1000 nm). For experiments that are less exacting, the model 671B is a lower-priced alternative with an accuracy of ± 0.75 parts per million (± 0.0008 nm at 1000 nm). 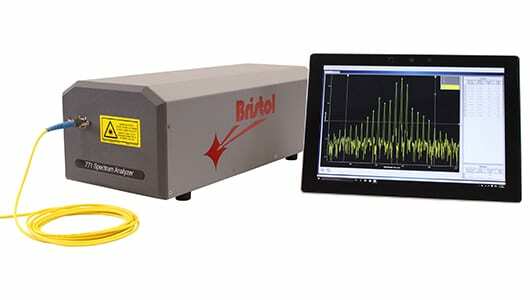 To achieve the reliable accuracy that is expected from Bristol Instruments, the 671 Laser Wavelength Meter is continuously calibrated with a built-in HeNe laser. This is an ideal reference source because its wavelength is well-known and fixed by fundamental atomic structure. To achieve the highest accuracy, the 671A system uses a single-frequency HeNe laser that is stabilized using a precise balanced longitudinal mode technique. A standard HeNe laser is used as the wavelength reference in the model 671B. The 671 Laser Wavelength Meter is available in four broad wavelength configurations to satisfy virtually any experimental requirement. These ranges are the VIS (375 – 1100 nm), NIR (520 – 1700 nm), IR (1 – 5 µm), and MIR (1.5 – 12 µm). 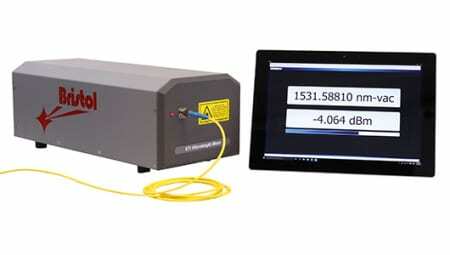 The laser under test enters the VIS and NIR versions of the 671 Laser Wavelength Meter through a pre-aligned fiber-optic input to ensure optimum alignment. Since fiber is not readily available for infrared wavelengths, the laser under test enters the IR and MIR systems through a free-space aperture, through which the internal HeNe reference laser is emitted as a visible tracer beam to facilitate alignment. The 671 system operates with a PC running under Windows, via USB or Ethernet interface. Software is provided to control measurement parameters and to report data, or the system can become part of an experiment using a library of commands for custom or LabVIEW programming. In addition, a web-based application can be used to display or collect measurement data with a tablet or smart phone.